Joining square steel tubing to mild flat bar steel with SSF-6 Silver Solder. Straight propane is used for this braze, as SSF-6 is lower temperature than most high content silver solders. The alloy finishes very nice and needing no machine work. 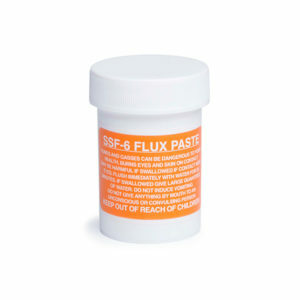 SSF-6 is food grade and works equally well on stainless steel, brass, copper, cast iron, bronze, and chrome moly. Oxy acetylene is preferred when working on large pieces but you can use propane, mapp gas, or natural gas and oxygen for many repairs and joints. 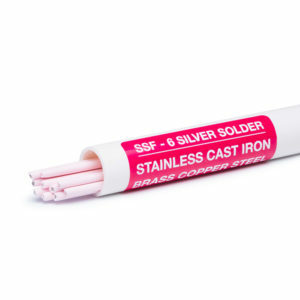 SSF-6 Silver Solder can be chrome or nickel plated, machined, painted, powder coated, drilled, tapped, etc. Forget needing to use your mig welder in most cases and changing wire and gasses. This all in one rod can make repairs look professional with just a hand held torch.